Sitting here checking site to take a break from a mind numbing court preparation. I will be editing 4.5 hrs. of video, and over 300 photos. We are representing ourselves on an appeal from District Civil to Circuit Civil Court. I won't get into my rant regarding members of the bar and judges I have observed and dealt with for over 25 years. We have filed all our own statement of claims, motions, and appeals. On the appeal was filed when District ruled in the favor of Defendants (them) took 1 year to get and was a simple case. His ruling was so bizarre and did not deal with case facts. On an appeal if the Circuit Court found no merit they would turn it down obviously they agreed with us and accepted the appeal (which does not mean victory). I do have attorney friends that help to a point, but the monetary value of the case is not enough to obtain representation on contingency. I tried to make this brief I could fill pages of pics that would be of no interest. We have never sued anyone and believe it to be a last resort when complaints fell on deaf ears. Thanks for this site has nothing to do with modeling, have cleared my head now back to war with the system. Denis, Elbow grease paid off. Voila, worked out well, looks very good. Use the rest of the skewers to grill some shrimp & veg kabobs. Coming along nicely, do not see how you folks adding the PE don't go blind. Well done Jack. A lot of you will be hitting the roads today to be with family. Be a defensive driver taking care of your precious cargo. Look out for the crazies and have the patience of Job. Count our blessings for the country we live in, and be generous to those less fortunate. If in your travels you see a scruffy with a sign will work for food go to the nearest store and purchase a to go dinner, would not take that much time out of your travels. It may be a homeless vet that needs a helping hand and someone to say thanks for your sacrifice after all he is probably in this state for the sacrifices he has made keeping us safe. This is what we all should do this day. Lou, The 16 is for sure, we always have maybes that show up and my son manages the Water Front Mission Store in Mobile, there are some homeless vets that have helped at the store and he has invited several for dinner he has offered to pick them up but these men have a hard time socializing with a large group of strangers, we have offered in years past but none have accepted maybe this year. So hope no leftovers! I received from my lovely daughter early am about 12 hours of labor. I am the designated dressing, mashed potatoes, and seafood gumbo Chef (use this loosely) for all Thanksgivings for the past 25 years. I needed to start yesterday (thanks daughter) Gumbo takes time it's going to be a chicken, sausage and shrimp gumbo. (I'll put it up against anybodies) Basic mashed taters spuds, milk, butter, salt and pepper,. (no garlic cheese bacon) made like there supposed to be. Dressing mix of herbal and cornbread, Conecuh sausage, chicken breast, some ground sirloin, 4 quarts of chicken broth, celery onion, bell pepper. feeding 16 souls. Son in law frying 3 turkeys and taking care of the hams. That's what I received today work and slave over a hot oven and stove and I love every minute of it for the ones I love!! 1960, local $.5 & $ .10 store had a promotional on car models and contest. Buy a car, build, and enter. You would get a dollar off your next model. I picked a 1958 Chevy Impala a first year for Impalas a whopping $2.49. I was so proud painted it gold and displayed it in the box and entered knew I was the big winner. Well they displayed all and I was a heartbroken kid, they had no categories or age limits. The winner was a 50s Mercury the guy chopped the top shaved all displayed on a small white fluffy piece of cloth with a mirror on top so the bottom detail could be seen, beautiful candy apply red with flakes. Added cloth to interior seating. The Modeler was in his twenties, I tried to think how I could squash the damn thing, did teach me a lesson no matter what you get into check the rules. Its like the Gorilla in the room says rules what rules there ain't no rules. I did enjoy the build and it started a life long hobby. Though Lou took his to the extreme great imagination. What can I say outstanding. Y.T. There are many mini food mixers on the market, some like the pic have a plastic spindle. Remove the blades from the spindle scribe lateral lines on the spindle wide enough to slide sandpaper in. Use PVA to hold paper which would be easy to u remove when paper lost its abrasive. Advantage some have variable speed, or use a speed controller. Someone may have already posted this, have not figured what the cons would be if any. Mark, Thanks for the links, awesome its a testament to what folks are capable of. Makes me feel like a Neanderthal working with a stone ax. Steve, Just caught your build excellent, fascinating story. Stories like these ought to history 101 in high schools "LEST WE FORGET"
John The one I made was a 2x4 and 4 to six nails and foam padding. The 2x4 was 24 inches long, used 3 inch nails with a large head, 2 holes were drilled every 6 inches at an angle, to cradle the hull I used thin foam doubled padding. you can actually rotate the hull in the cradle quite a bit to change the angle depending on where you are working. Man it is ugly but works well if you have shallow pockets. Hey CD, Its amazing all the goo gahs and foofarahs available to dress up a plastic model, man times they are a changing. I'm always impressed with the artistic and imaginative prowess of all the plastic and card builders on this site. Beautiful work I believe your doll is almost ready for a walk down the red carpet. Remember him well, have some vinyl, Americana an older Guthrie contemporary maybe younger. Dave, I agree with Jim Rogers and all of his suggestions, even the right viscosity CA may be better than holing and pinning considering the time involved. 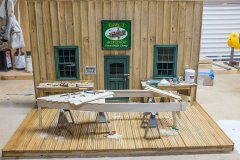 I am not a pro I rank myself as an amateurs amateur, model builder in training. I was planking my HMS Vic. and grabbed a push hammer, it worked well on basswood planks, ply bulkheads a problem I was very careful about pressure. About midships had bent 3 nails at this one spot (not a bulkhead) on the 4th nail with more pressure caved in 3 rows of planks 2 inches in width messed up 4 gun ports. Sad day in Mudville. Was able to sloppily repair and the 2nd layer of planks covered the mess I created. I took that push hammer threw it in the bad tool box never to be seen again. Lou your lucky she didn't file a complaint with your P.D. for use excessive force and police brutality, video it and post it on UTUBE and get 10,000 likes and have PETA protest in front of your residence. Nice build looking very very good.